Our team has extensive knowledge of and experience detecting leaks, and can quickly determine the repairs your building needs. Constitution Contracting offers quality roof repairs, inspections and maintenance services that are guaranteed to keep your roof in good condition throughout the life of your business. From medical buildings to industrial facilities and office buildings, every commercial building needs a quality roof. The better the condition your roof is in, the less you will have to worry about moisture penetration, energy waste and other problems that raise your costs and damage your inventory. 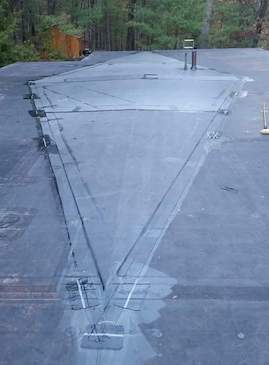 Since 1998, we've been providing top quality repairs and trusted advice, as well as an unbeatable leak-free guarantee when we install our IB roofing systems, flat roofs, single ply roofs, EPDM/rubber roofs, TPO, PVC, metal roofs, copper roofs, cedar roofs and other high-quality roofing systems. We offer warranty options of up to 30 years on flat commercial roof systems, so we guarantee we have the best solution for your roofing needs! 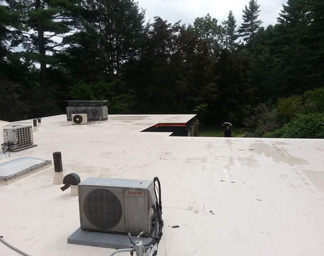 With more than 30 years of experience providing flat roof repairs throughout Lowell, MA and the surrounding areas, we understand the urgency of repairs needed for flat roofs. 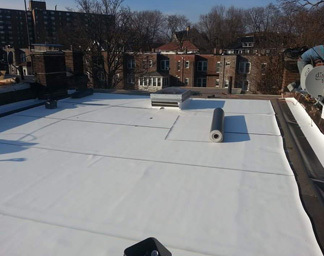 Since water does not drain as quickly from flat roofs as it does from pitched ones, it’s important to repair the source quickly and effectively. If not, more water can leak through your building - causing a variety of damage that will be harder and costlier to fix. As soon as you report a leak, we will travel to your premises, close the leak and seal it shut to prevent similar problems from happening again. We’ll provide you with various warranty options for different commercial roof systems; all our calculated costs will be accurate and documented for you to view at any time. Constitution Contracting encourages you to get your roof inspected at the first sign of trouble, which is why we offer such inspections for free! Not only does this allow us to catch signs of damage early, but it also makes it easier for you to decide if repairs are worthwhile. After assessing your roof, we will come up with a precise estimate for both the cost of repairs and the likely lifespan of your roof. Based on this information, you can decide whether it’s worthwhile to repair the roof or to install a new one. Constitution Contracting invests only in the highest-quality roofing materials for any and all repair jobs. This includes not only the roofing itself, but also vents, drains, flashing and other features that are essential for keeping your roof clean and dry. We also use quality sealants on all of these areas, which helps further keep water and debris from penetrating and/or leaking through your roof. At the first signs of a leaky roof, quickly contact Constitution Construction to get a team on-site and provide you with the best long-term solution to ensure the safety of your business and building!